TORONTO – When do the alarm bells sound for the MLS Cup champs? Not yet. Not even after Toronto FC’s disappointing 1-0 loss to FC Dallas on Friday night before 27,549 spectators at BMO Field. The loss was the Reds’ seventh of the campaign – they only lost five times in MLS in 2017. But their poor 3-7-1 record comes with an asterisk. Specifically, injuries have decimated this club, especially at the back where at one time this season Toronto was minus its top four central defenders. No team, not even a TFC side reputed to be the deepest in MLS, can survive that. To be sure, things don’t look good at the moment for Toronto, sitting ninth in the Eastern Conference, three spots and seven points out of a playoff berth. Are the reigning MLS Cup champs in crisis mode, though? No. Only a third of the campaign is in the books, and you have to think that once TFC gets healthy, with its quality, they’ll turn things around. Captain Michael Bradley admitted that injuries have been an issue this season, but he refused to offer that as an excuse for the club’s losing record. “I’m not sure I’ve seen anything like it. [Injuries have] been a killer… But even with all of that, there’s no way we should lose the game tonight, regardless of who’s healthy and who’s not,” Bradley stated. It’s difficult to envision Toronto finishing in the top two in the East, thus earning a first-round bye in the playoffs, after this laboured start to the year. But let’s hold off on writing the obituary on their season for a little while longer. It’s May 25, after all. MLS campaigns aren’t defined by where you are in the spring, but rather in the fall, and there’s a lot of soccer to be played from now until October. Injuries aren’t the only problem at the moment for TFC, who continue to squander scoring opportunities with alarming regularity. “Primarily, [tonight] was about missed chances and giving up a soft goal. We had 23 shots, and zero goals. … Goals change games, goals change the flow of games, goals change the approach of the opposition, they change a lot of things,” coach Greg Vanney said. Toronto’s next five matches are against Eastern Conference rivals, with three of them on the road. 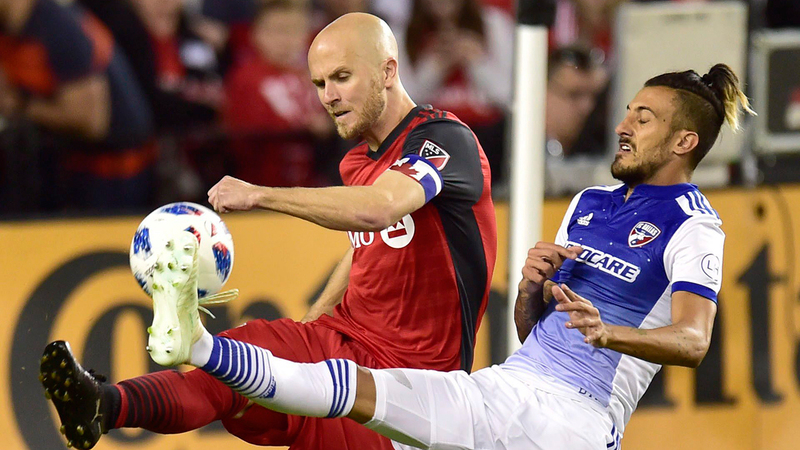 It’s an important chance for TFC to respond “in a big way,” according to Bradley. “We have to look pretty closely at ourselves and continue to understand where things need to improve, and where we have to pick things up. Our margin for error is becoming slimmer and slimmer with every game. There’s a lot of games left, we still feel like we have a good team; we have a team that can win on a lot of days. But the reality right now is that we’re letting games slip away from us too consistently,” Bradley stated. TFC goalkeeper Alex Bono was away with the U.S. national team, which meant backup Clint Irwin started on Friday. Also missing were forward Jozy Altidore (foot), left fullback Justin Morrow (calf), defenders Drew Moor (quadriceps) and Ashtone Morgan (hamstring), and midfielder Nico Hasler (quadriceps). Defender Eriq Zavaleta, and midfielders Marky Delgado and Ager Aketxe all had minor injuries and did not dress. With so many defensive absences, Bradley shifted from his regular spot in central midfield into the middle of Toronto’s three-man defence, flanked by Gregory van der Wiel and Chris Mavinga. Star forward Sebastian Giovinco returned to the starting line-up after being suspended for the Reds’ last match. There was also a rare start for 20-year-old Canadian midfielder Liam Fraser. Toronto started the game brightly with Giovinco earning a free kick in the opening 20 seconds. The Italian sent a beautiful curler on net, but Dallas goalkeeper Jesse Gonzalez made a super diving save. Shortly after, Gonzalez came up a bit to deny Giovinco again, parrying away his half-volley attempt from inside the box. Dallas opened the scoring off a simple throw-in. Santiago Mosquera managed to get in behind Bradley far too easily, scampered down the left wing and to the end-line before cutting the ball back into the middle. Maximiliano Urruti deflected Kellyn Acosta’s shot past Irwin to give Dallas a surprising lead. “We lose a challenge on the sideline and it ends up going to our end-line, and then a cross into the box off a counter-attack. You can’t give that up,” Vanney offered. Giovinco earned a penalty just moments later as he was hauled down by Matt Hedges after a gorgeous give-and-go sequence with Tosaint Ricketts. Again, Gonzalez thwarted Giovinco when the Italian stepped up to the 12-yard spot. The Dallas goalkeeper wasn’t finished. In the 34th minute, Auro Jr. played a dangerous cross into the box for Victor Vazquez to head on goal, only for Gonzalez to make another stunning stop. He couldn’t hold onto it, but Ricketts couldn’t bury the glorious rebound opportunity. Mavinga limped out of the game late in the first half with a hamstring injury. He was replaced by fellow defender Nick Hagglund, who last played and started in an MLS game on March 17 after being out injured. The introduction of Hagglund saw coach Greg Vanney go to a four-man defence, with Auro Jr. dropping into the back line. Not to be outdone by Gonzalez, Irwin made an important kick save on Michael Barrios from in close just before the halftime break. Toronto continued to be wasteful in front of goal at the start of the second half. Giovinco delivered a cheeky free kick along the ground and under the defensive wall that whispered past the post with a beat Gonzalez rooted to his goal-line. NOTES: Dallas leads the all-time series against Toronto, with 10 wins and five draws in 17 meetings… Canadian midfielder Jonathan Osorio played in his 150th MLS regular season game on Friday, and made his 184th appearance for TFC in all competitions. Both are franchise records… Toronto returns to action next Saturday on the road against the Columbus Crew.